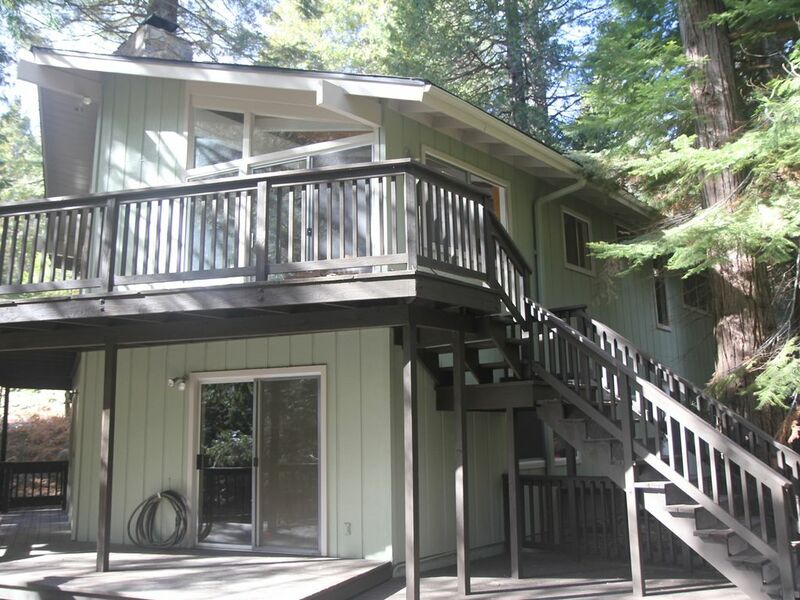 Located just 2 miles from the south gate of Yosemite, our family-friendly modern home offers a peaceful retreat as you sit out on either of our two very large decks enjoying the fresh smell of tall pines and the serenity of our wooded lot located at the end of a cul-de-sac. Our home is well-appointed with two wood burning stoves, new wall-to-wall carpets, and several new pieces of furniture and mattresses, cookware, and linens. Just a short drive to Mariposa Grove, Wawona, and Bass Lake. Great for exploring Yosemite and Sierra National Park while still enjoying the convenience of local supermarkets, restaurants, gas stations, and a movie theater. The home can accommodate up to 9 people: 2 bedrooms, a large downstairs with bunk beds, fold-out sofa and fold-out chair, 2 full bathrooms, wifi, cable television, DVD player, 2 wood burning stoves, dishwasher, microwave, coffee maker, toaster. Due to the presence of bunk beds, fold-out sofa and fold-out chair, it is best for people with kids rather than all adults. For the past 25 years, we've been vacationing at Yosemite National Park. We finally decided to look for a place to purchase so we can continue to enjoy the area with our children for the many years to come. Every time we visit our vacation home, we immediately relax by sitting out on our large decks amongst the tall pines, and looking at all the amazing stars above in the evening. Occasionally, we'll see deer grazing in our wooded lot. Towels, small shampoos, lotions and soap provided. Dining table adjoining living room. Dining room table seats up to 7 people. Very quiet property and nice area. When we got there inside was clean, but outside was messy and wasn't clean for the customers. It took almost 45 minutes to clean outside balconies and get organized for outside seating! There was also no bathroom lock! We enjoyed the place but the owner was very peaky about after stay cleaning! We had a large list of check out procedures, which we did. But we did not realized that we have to clean extremely high quality so the cleaning team hast to do very little staff after us! We cleaned all the dishes, kitchen, took out trash and drove around 5 miles to dump it - this area does not have trash beans! After everything I received a letter from the owner, mentioning that we left not very clean the area and she overcharged us explaining that we burned the carpet by fire place, did not clean the stove etc. I believe it wasn't fair of holding the deposit! Be careful faulks when you rent this place. It is unfortunate that you feel that way. Our house cleaner said it was quite messy compared to the many houses she has cleaned before. As shared with you after your stay the following were out of the ordinary from past renters: 1) extra laundry needed to be done because all of the towels, blankets and linens put out for 9 people were used even though you said you had less people there, 2) things were strewn around everywhere, 3) trash was out in the parking area and some found in the yard, 4) ashes and soot all over the downstairs fireplace area, 5) one burner on the stove was black all around it and now the stovetop is permanently damaged, 6) living room furniture was completely moved around, 7) small rug downstairs was burnt and could have caught on fire. Of all the guests we have had in the past, no one had issues with the checklist. The rental agreement you signed before your stay clearly states you need to take your trash with you. During your stay you emailed me saying the place was gorgeous and you wanted to have a late check out. We let you check in early and check out late. We visited Yosemite in early November and stayed at this home. The property was clean and nicely supplied with kitchenware, boardgames, firewood, wifi, and Dish television. The main living space is open concept with a wraparound view of the woods and a nice fireplace. The bedrooms were simple and clean, with everything you'd need. We definitely enjoyed our stay here. The property manager was very responsive and helpful, going so far as to allow us to reschedule our visit as our original reservation fell during the time of the Ferguson Fire, and nearby areas were being evacuated. We would recommend staying here. The setting on a cul-de-sac, in the big trees with the sound of the creek below was so amazing. The setting on a cul-de-sac, in the big trees with the sound of the creek below was so amazing. Our family of six had ample space with two floors, both with large deck areas for just quietly taking in the great forest or for a enjoying a meal on the picnic table. We would definitely return. Glad you enjoyed the quiet surrounding at our house. It is too bad your trip was shortened due to the Yosemite fire. Hope you can return in the future. We had a lovely stay at Greenwall which is a short drive from Yosemite.. We were also lucky enough to see Bear right outside the Property in the early hours of the morning. Very nice. Love the location and atmosphere. Could use some updating. Would stay there again. Very beautiful location. About 15 minutes from Yosemite entrance and Mariposa Grove. About an hour from Half Dome. Very nice accommodations, definitely recommend. Only reason for not giving 5 stars is that it could use some updates. Owner quick to respond to questions and very helpful. Thank you for an enjoyable stay. There is a laundromat 20 minutes away in Oakhurst. We've used it some times ourselves. The roads to get there are no more curvy than the roads in Yosemite. We've never had someone stay at our place who did not plan ahead regarding laundry. As parents who use VRBOs ourselves, this is one of the first things we check on long trips, as not all rentals offer this. California has been in a drought for several years and there were and are wildfires in the area. Conserving water is good for Yosemite. The entire state has requested conversation of water. When guests stay more than 6 nights, we offer guests use of the washer/dryer. This normally is set up in advance as access to the washer/dryer needs to be cleared with our housekeeper. The smokey smell downstairs is due to the use of the wood burning stove. You are the first guest to have mentioned this as a problem. We will ask our housecleaner if there is anything else that can be done. Located just 2 miles from the south gate of Yosemite National Park and 13 miles from Bass Lake.